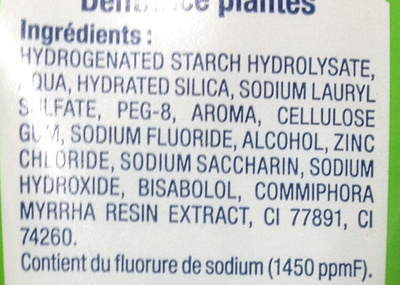 hydrogenated starch hydrolysate, aqua, hydrated silica, sodium lauryl sulfate, PEG-8, aroma, cellulose gum, sodium fluoride, alcohol, zinc chloride, sodium saccharin, sodium hydroxide, bisabolol, commiphora myrrha resin extract, CI 77891, CI 74260. Product added on February 15, 2016 at 1:07:56 PM CET by jeanbono. Last edit of product page on February 15, 2016 at 1:11:26 PM CET by .